As a new type of green solvents, deep eutectic solvents (DESs) were used as pretreatment media for the nanofibrillation of ramie fibers (RFs). Two DESs, choline chloride-oxalic acid dihydrate (CO) and choline chloride-urea (CU), were formed at 100 °C and then applied to decompose RFs. The DES-pretreated fibers were nanofibrillated using a planetary ball mill, and their properties were analyzed. 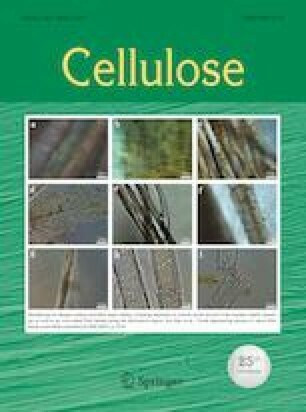 During the DES pretreatment, CU DES could only dissolve some of hemicelluloses in raw RFs, while CO DES could degrade some oligosaccharides and a part of amorphous cellulose to loosen the fiber structure. 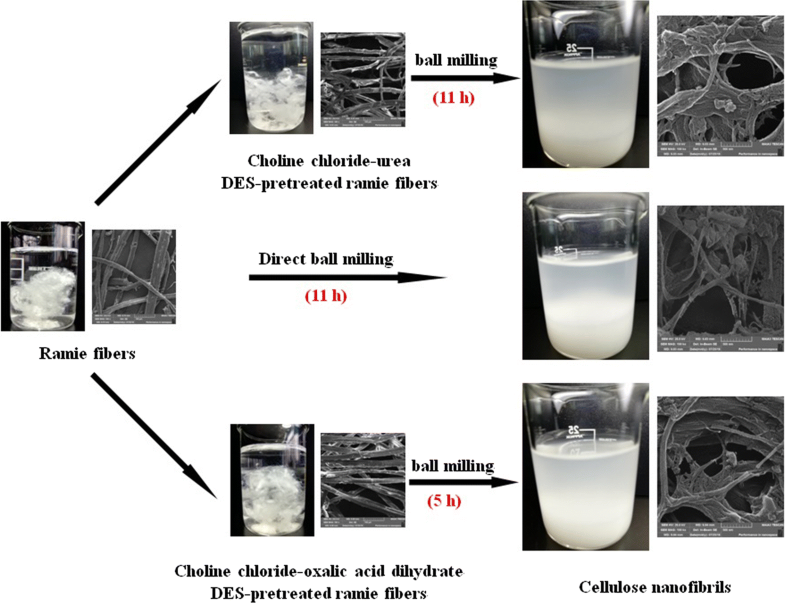 Therefore, only the CO DES pretreatment could significantly enhance nanofibrillation of the RFs with a low hemicellulose content in this study, as indicated by the decrease of milling time (from 11 to 5 h) to obtain desirable cellulose nanofibrils (CNFs). After 7 h CO DES pretreatment at room temperature and a subsequent ball milling process, a turbid and gel-like CNF suspension with a mean equivalent spherical diameter of 262 nm was obtained from RFs, and the mass yield of CNFs reached 94.06%. The CNFs also showed a crystallinity index of 66.51% and a thermal stability with Tmax = 322.6 °C, and the produced CNF film had a tensile strength of 52 MPa. Overall, the CO DES pretreatment has great potential for use in the production of CNFs from RFs. The online version of this article ( https://doi.org/10.1007/s10570-019-02290-7) contains supplementary material, which is available to authorized users. This work was financially supported by the National Natural Science Foundation of China (No. 21878326), the Earmarked Fund for China Agriculture Research System (No. CARS-19-08B) and the Agricultural Science and Technology Innovation Program of Chinese Academy of Agricultural Sciences (No. ASTIP-IBFC07). Alfred D. French (Agricultural Research Service) and Zhe Ling (Beijing Forestry University) were thanked for the using of Mercury software.